Above you can see the exterior of the main building of the Vanalinna Haridusholleegium (VHK) which is a truly remarkable enterprise, offering education and culture in Tallinn. Each morning during the Festival, Lauds are sung according to the Cistercian use by a small group of devout early risers. Above you can see the entrance to the Cathedral of St Peter and St Paul from "Vene" which is the street name. "This is truly the house of God and the gate of heaven. Built 1844. Renewed 1924." In the sacristy afterwards, the excellent team of servers, guided by MC René. Fr Ivo arranged everything for Mass. Küng criticises Pope,sun rises in East, bears etc. In his post are you scared?, Diogenes reports that Hans Küng has criticised the Holy Father's generous initiative in offering Personal Ordinariates for Anglicans who wish to be united in full communion with the Holy See as the "unecumencial piracy of priests". Küng says:The pope’s basic message is: “Traditionalists of all churches, unite under the dome of St. Peter’s!”Diogenes observes:Küng seems to think that readers will find that message alarming. The Holy Father has addressed the plenary assembly of the Pontifical Council for Social Communications on the subject of the new media:These days you have paused to reflect on the new technologies of communication. Even a not very attentive observer can easily see that in our time, thanks to the most modern technologies, a genuine revolution is taking place in the realm of social communications, of which the Church is ever more responsibly conscious. These technologies make possible a speedy and penetrating communication, with a capacity to share ideas and opinions; to facilitate acquiring information and news in a personal way accessible to all.I must confess to chuckling at the phrase "even a not very attentive observer" - there are still some who are totally oblivious. My goodness but Estonia is a civilised place! At Talinn airport there is a shop selling fine cigars. I used up my Estonian Crowns to buy some of their more modestly priced varieties. Annexed is a café where you are invited to smoke said cigars while enjoying a cup of coffee. And this being Estonia, (as indeed applies in Helsinki also) everywhere has free wifi as a matter of principle: hence this post while my Easyjet flight is delayed - by an hour so far. This morning after sung Lauds, I met Professor Piotr Jarosynski, a Polish metaphysician who teaches at Lublin university. Unfortunately I missed his lecture in order to get to the airport in good time (I should not have bothered!). He organises international conferences in Lublin to explore the use of media in the service of culture and I may possibly get to one such conference in the future. The Catholic Union is holding a Drinks Reception at St Wilfrid’s Hall, the London Oratory 19 November 2009, from 7-9pm. The Reception will be preceded by Mass in the Little Oratory at 6:30pm in the extraordinary form. From the Catholic Union website:The Union exists in England and Wales and Scotland to advocate, express and uphold, by all proper and legitimate means, Catholic moral and spiritual principles and interests, and to promote Christian standpoint in public affairs, regardless of political parties and affiliations.The Catholic Union has taken on a new lease of life in recent years. For more information about the Union, see the website. The Catholic Union is actively recruiting new members to ensure that the Catholic voice continues to be heard at Westminster on issues such as euthanasia, abortion and adoption. Marko Tervaportti had to get back to Helsinki (2 hour ferry from Tallinn) and has let put up a couple of photos from his collection. Above is a photo from Mass yesterday in the Cathedral of St Peter and St Paul. Below is a video that he made at the Mass, the Dance, and at Lauds this morning. Don't worry - we did not have the dancing and the Mass at the same time. Last night I celebrated Mass in the usus antiquior at the Cathedral of St Peter and St Paul for the feast of St Simon and St Jude. The choir sang the chants from the Graduale, with Mass II. Parts of this were done in a very Eastern-sounding style with a faux-bourdon arrangement but with the dominant note constantly sung by one of the cantors. The effect was quite stunning and very prayerful. After Mass, I was taken to the "Dance Club" with Leanne Parbo "Vanalinna Muusikamajas" ("Old Town Music"). This was in a house which is part of the whole Vanalinna Haridusholleegium (VHK - "Old Town Education College") school complex. This is a remarkable achievement, offering education through all grades, including the fine arts, based on a "master-disciple" ethos. Just a quick "Hello" from Tallinn. Immediately on arriving, I caught the end of an interesting lecture on Icons by Nikita Andrejev. Later today I am just off now to celebrate Mass at the Cathedral. Tallinn has a beautiful old quarter but it is desperately sad to see prominent strip clubs and the like littering the edges of the quarter, driven in no small measure, I expect, by the "Stag Party" trade from England. I have already take a few photos from the old quarter but guess what? I forgot the mini USB lead so can't upload them. I expect to get that sorted tomorrow in my nice spotlessley clean and very nordic hotel. Room service includes Reindeer Liver with Wasabi mushrooms. [...] One possible senior job becoming vacant in Rome is the powerful position of Prefect of the Congregation for Bishops, which helps advise the Pope on the appointment of new bishops across the world.See: Is Cardinal George Pell headed to a key Vatican post? If this were true, it would be very good news indeed. Time to storm heaven with prayers. Dearly beloved, forasmuch as all men are conceived and born in sin: and that our Saviour Christ saith, None can enter into the kingdom of God, except he be regenerate and born anew of Water and of the Holy GhostMeet, supplications, dispose, prevent, forasmuch, regenerate - not to mention vouchsafe, and graft - "Them's all fancy words!" 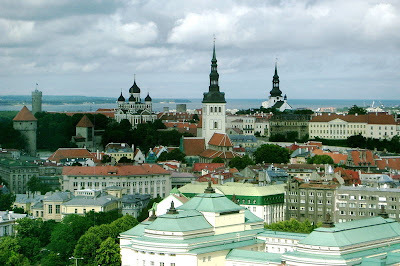 The TriaLogos Festival has been held in Tallinn, the capital of Estonia, each year since 1998. I will be attending the Festival from Wednesday to Friday this week. 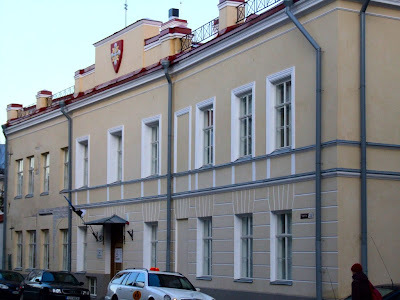 I have been asked to celebrate a sung Mass in the usus antiquior in the Cathedral of St Peter and St Paul, Tallinn (picture below). This will not be an unusual thing since the Cathedral has Mass in the usus antiquor twice a month. I'll also celebrate another usus antiquior Mass on the Thursday in the Chapel of the Conference Centre. 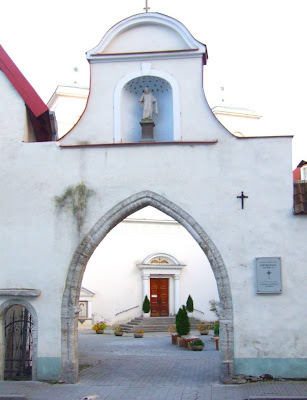 On Thursday morning, I am giving a paper on the life and work of Fr Adrian Fortescue, and in the afternoon I'll be speaking at the launch of the Estonian translation of Cardinal Ratzinger's book "On Conscience" which is published by the Institute for the Culture of Life [Elukultuuri Instituut]. I have had a lot of very positive feedback from people who came to the 40 Hours devotion in the parish. This has all confirmed my own enthusiasm for it and I am sure we will be able to do even better next year. The Mulier Fortis has posted more photos, some of which I have pasted in below. 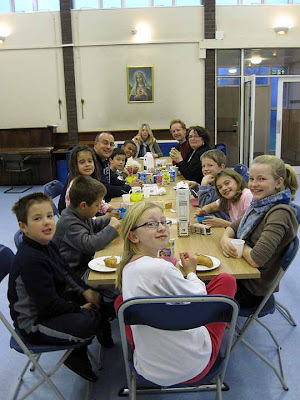 The young people who stayed all through the second night had breakfast together in the Hall in the morning. The adult helpers deserve a pat on the back for their generosity too, in supervising and making sure that everyone was safe. 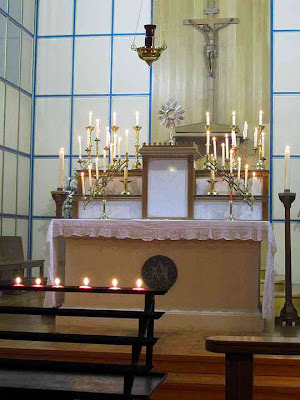 For the second night of our Forty Hours devotion, we had a Missa Cantata (the Mass for Peace) at the Lady altar. It was a little cramped so we only had the MC, thurfier, two acolytes and two torchbearers. I was proud that all the servers were under 15 years old. My sermon drew largely from Pope Benedict's writing on truth and conscience since I am reading his little book on conscience at the moment. Tonight the Youth Group are staying all night. After Mass they got in some fish and chips and we watched the film about St Thérèse (Amazon link below) which came out a couple of years ago. It was perhaps a little slow for some of the younger ones but the second half of the film is quite moving, and rewarded those who persevered. During this time, there was a good number of people watching in the Church and, after the film, the youngsters went in to take a turn. In a recent post, I wrote about the "Personal Ordinariate":"It is not the same as a Personal Prelature which canonically only concerns clerics"Fr Paul Hayward replied in the combox: - that might be the impression from just looking at canon 294 of the Code of Canon Law, but in view of canon 296, plus the specific provisions of the Apostolic Constitution "Ut Sit" by which the only Personal Prelature to date, Opus Dei, was established, and the Statutes of the Prelature as given by Pope John Paul II, it is quite clear that the lay members are fully incorporated into the Prelature. This evening our Forty Hours in the parish began with the splendid ceremonies of the Missa Cantata, followed by the Blessed Sacrament Procession and the Litany of the Saints. 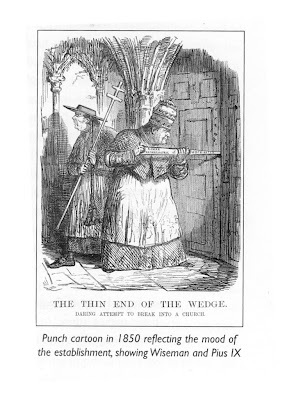 H/T to Anna Arco for this splendid cartoon from Punch in the wake of the restoration of the Hierarchy in 1850. As Anna points out, it does reflect the mood of the Times both then and now. 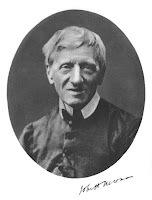 Following the announcement of the provision for Personal Ordinariates for Anglicans wishing to come into communion with the Catholic Church, the blog for the cause of Newman's canonisation offers a topical reflection on Newman's perspective, especially on a proposal to the Holy See by Ambrose Phillipps de Lisle. I received news of this event today and thought that some of you might like to go along. You can find out more information about the pictures at the Radiant Light website. The Oxford University Newman Society has a new blog which has been given some history from old reports of previous events. The Michaelmas Term programme started off with a talk by Fr Thomas Crean OP on the inconsistencies of atheism. A star event in this term's programme will be on 30 November: a symposium in which Evan Harris MP and Bishop John Arnold will debate the place of Christianity in the British Constitution. From various sources, information has been pouring in about the recent arrangement made by the Holy See for the new “Personal Ordinariates”. In this article I will try to piece together a few principal points of interest. This was not an initiative of the Holy See but of over 50 Anglican Bishops, of whom about half are still in the Anglican Communion, and about half have seceded in recent years. There was no specific negotiation with the Traditional Anglican Communion. The Holy See was concerned that the approaches of Anglican Bishops could not, in all charity, simply be dismissed, as some would have preferred. To reiterate the point, the Holy See did not initiate this process but responded generously to appeals from those who wanted to come into communion, rather than simply insisting that each individual should be received individually. 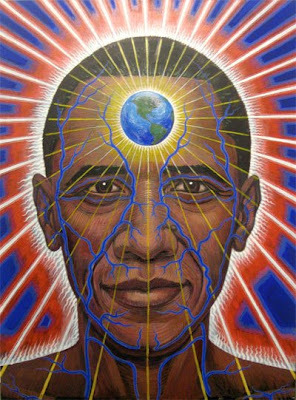 I am receiving information from many sources about today's events and trying to filter it in the midst of various other duties. I'll post something in due course to try to give some background to these events. The Holy See has announced a forthcoming Apostolic Constitution which will establishPersonal Ordinariates which will allow former Anglicans to enter full communion with the Catholic Church while preserving elements of the distinctive Anglican spiritual and liturgical patrimony. Under the terms of the Apostolic Constitution, pastoral oversight and guidance will be provided for groups of former Anglicans through a Personal Ordinariate, whose Ordinary will usually be appointed from among former Anglican clergy.The Note from the Congregation for the Doctrine of the Faith specifies that the Apostolic Constitution "provides for the ordination as Catholic priests of married former Anglican clergy" but that Bishops will have to be unmarried men, in accord with the historic tradition of the Catholic and Orthodox Churches. However, the possibility is left open for the Ordinary to be a priest rather than a Bishop. The Catholic News Agency reports speculation in the Italian media that the announcement will concern the reception of a large number of members of the Traditional Anglican Communion, allowing them to use their own rite. Given the presence of the CDF and the CDW at the Rome briefing that seems not unlikely. Later this morning we can all stop speculating! The website for the cause for the Canonisation of John Henry Cardinal Newman has an article highlighting the reflections of the distinguished philosopher Alasdair MacIntyre: Alasdair MacIntyre on Newman: Education, Conscience and Faith today. This week, we have the Forty Hours Devotion at Blackfen. This is the first time we have had this at Blackfen for decades, and it is in fact the first time that I have taken part in the devotion. We begin with Missa Cantata at 8pm on Thursday, with Procession and Litany. There is an English Mass at 10am on Friday, then a Missa Cantata at 8pm. The devotion concludes with Missa Cantata on Saturday at 10.30am with Litany and Procession. I was nervous before the weekend as people had been slow to sign up. The parish Youth Group are going to be there all night Friday to Saturday and then the excellent Knights of St Columba said that they would cover any slots unsigned for. Now, however, most of the hours are covered and so the Knights can choose their times to provide a little extra security for others. It's a good job I checked the Vatican Bolletino this evening. I haven't seen this picked up elsewhere except for the redoubtable Rafaella at Papa Ratzinger blog and Le Suisse Romain:We inform accredited journalists that tomorrow, Tuesday 20 October 2009, at 11am, in the John Paul II Hall of the Press Office of the Holy See, a briefing will be held on a theme pertaining to the relationship with the Anglicans, at which His Eminence Cardinal William Joseph Levada, Prefect of the Sacred Congregation for the Doctrine of the Faith, and His Excellency Mgr Joseph Augustine Di Noia OP, Secretary of the Congregation for Divine Worship and the Discipline of the Sacraments will take part.That's all very interesting. I'll have to keep the phone charged to check up on the briefing tomorrow lunchtime. I am happy to pass on news of this forthcoming talk in the London Oratory's Call to Youth series. Father Crean is the author of the best-selling A Catholic Replies to Professor Dawkins, and has recently published an excellent work of Catholic apologetic entitled "Letters to a Non-Believer". For information about this and other publications, see the webpage for Fr Crean OP. The question of religious liberty has been one of the hottest potatoes of theological debate in recent decades. Father Crean has studied the subject in depth. Please come along if you are 18-35 & bring your friends. 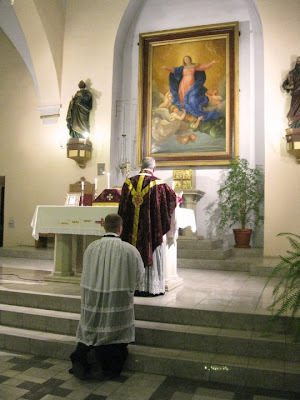 If you are new, do make yourself known to Fr Julian Large. As usual: food & drink afterwards. 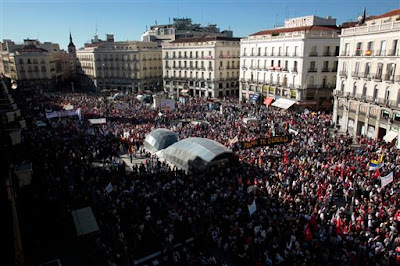 There was another massive pro-life demo in Madrid yesterday, with the theme "Cada Vida Importa" ("Every Life Matters"). Even the regional government admitted that more than a million turned up - the organisers estimate 2 million. Zapatero's abortion bill would allow abortion on demand up to 14 weeks and allow doctors to carry out abortions of the babies of girls aged 16-17 without their parents' consent. The group Giovani e Tradizione have been holding their "Summorum Pontificum" conference at Rome. The conference was mentioned in the greetings by the Holy Father after today's Angelus. 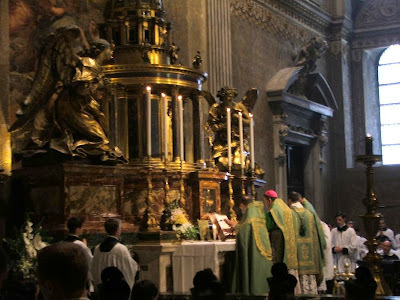 Today, Archbishop Raymond Burke, Prefect of the Apostolic Segnatura, said the first Solemn High usus antuquior Mass in the Basilica of St Peter's for 40 years, in the chapel of the Blessed Sacrament. The Mass was attended by Bishop Schneider (author of "Dominus Est"); Mgr Pozzo (Secretary of Ecclesia Dei) and over a hundred priests were present. 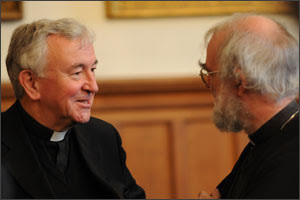 There are more photos (including the above one) at the Messa in Latino blog. Joe at Catholic Commentary has posted a follow-up comment to my remarks on unity and the SSPX in the context of State interference in funeral of Chinese Bishop. It is well worth reading in view of Joe's familiarity with the Holy Father's Letter to Chinese Catholics. The Faith group at the John Fisher School continues to thrive under the guidance of the indomitable "Sir Dan of the Blogosphere". Dan acts as a kind of human version of Google Reader, phoning me up regularly with carefully chosen snippets from Rorate Caeli, LifeSite News, Fr Z, NLM, St John's Valdosta and others. He is a great example of a "Silver Surfer" - he was a teacher when I was a boy, and has carried on in a pastoral role at the school since his retirement. And just by way of serendipity, I would like to mention that the Sr Amada, Regional Superior of the Missionaries of Charity, and Sr Inocencia from the M.C.’s Edinburgh house visited the Sisters of the Gospel of Life recently. 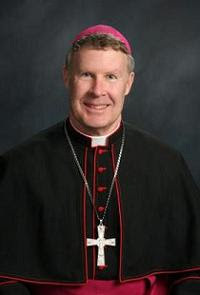 A correspondent sent me a link to a pastoral letter of the Most Reverend R. Walker Nickless, Bishop of Sioux City: Ecclesia Semper Reformanda. It is excellent. The letter is over 8,800 words (excluding the 46 footnotes), so all I can do here is give an outline and a few quotations that almost jumped onto the clipboard. I see that Fr Z has already picked this up and is also very enthusiastic about it. Lord Joffe, who has campaigned strenuously for the legalisation of assisted suicide, is giving a public lecture at Bath University to promote his views. The University wishes the public to have their say in a poll on their website. It is a good, straightforward question "Should assisted dying be legalised for the terminally ill?" Currently there is a massive majority of "No" votes - go over to help keep it that way. 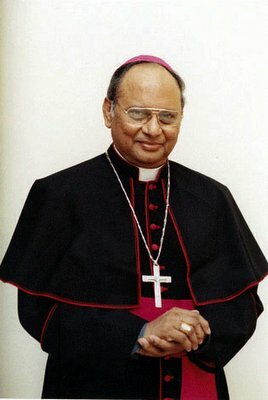 I would recomment all faithful, including the religious, to receive Holy Communion reverently kneeling and on the tongue...Archbishop Ranjith impressed me greatly with his humility and urbanity when I met him briefly in Rome a few years ago. His firm but kindly guidance on matters liturgical goes hand-in-hand with his robust and courageous dealing with the government. Just over a month ago, I reported the fairly widespread speculation on the Vatican Team chosen for talks with the SSPX. This has now been confirmed by the Press office of the Holy See. The talks are to begin on Monday 26 October. they will take place at the Palazzo del Sant’Ufficio, the home of what is now called the Congregation for the Doctrine of the Faith. I expect that the morning coffee break will be even more of a buzz than it normally is. If you want to prepare a Novena to pray for the success of the process, you could begin this coming Sunday. President Obama was recently awarded the Nobel Peace Prize, as you have probably heard. Many Catholics immediately protested for various reasons - not least his support for abortion which the Blessed Mother Theresa of Calcutta described as "the greatest destroyer of peace in the world". Many commentators have cynically (but perhaps realistically) pointed out that he received it simply for "not being President Bush. Catholic bloggers were astonished when the Vatican Press Office speedily released a note of congratulation. Now L'Osservatore Romano has, Deo Gratias, published an article by Lucetta Scaraffia which is critical of the award. Perhaps the various Vatican media operations need to sign up for the increasingly popular course on Rocket Science. 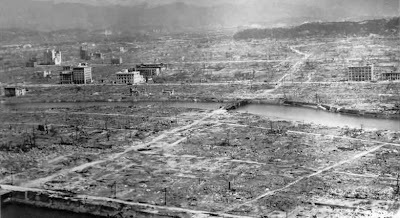 Many thanks to a correspondent for this story of Fr Hubert Schiffer and seven other Jesuits who were in a house about a kilometre from the centre of the blast at Hiroshima and survived while everyone else within that distance was killed instantly. See also another account, and a further account. Fr Schiffer put the survival of the small community down to their devotion to Our Lady of Fatima and their daily Rosary. C-Fam, the Catholic Family and Human Rights Institute, have a petition to the UN: "International Call for the Rights and Dignity of the Human Person and the Family" in support of the right to life and the right of parents to education their children. They have over half a million responses so far. In order that this natural, less invasive method is made more publically known, Ira Winter, Co-ordinator of the Life FertilityCare Service, is coming to speak in High Wycombe this month, on October 21st. This day is not solely aimed at those who have personal issues relating to fertility/infertility but to try and get the information out into the public domain about natural fertility care. Any medical personnel are particularly welcome. Back in March, I mentioned the new film "The 13th Day". It has opened at various locations in the US today. at St Dominic's Convent, Stone, Staffs. Led by Fr Thomas Crean O.P & Sr Valery Walker O.P.